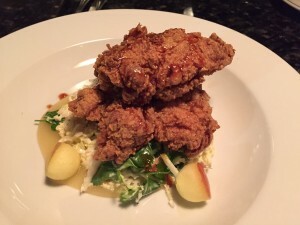 We celebrated Steve’s birthday at Steel & Rye in Milton, a large, industrial looking space serving new American fare with locally sourced ingredients. I have been a fan of Chef Chris Parsons since his days at Catch in Winchester and was glad to see him back in the kitchen. The complimentary valet was a nice surprise. We arrived a few minutes ahead of our reservation, so we took a seat at the bar, but they promptly seated us a few minutes later. Steve expressed surprise at the size of the restaurant; he estimated 175 seats. 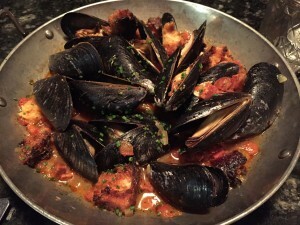 We started with Maine mussels (smoked tomato, chorizo, torn bread, soffritto, lobster broth, $14). The portion size was moderate, but the mussels were tender and the broth was bursting with flavor from the chorizo. I made sure to spear every last bit of chorizo. 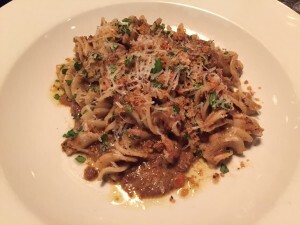 We shared the fusilli Bolognese ($22) for our pasta course. The homemade fusilli were large and toothsome, but the sauce was under seasoned and the beef was gritty. It was the weakest part of the meal. It reminded me that I need to return to Sweet Basil in Needham soon. Sampling the fried chicken at Cook the night before whet my appetite for more, so I readily agreed when Steve suggest the buttermilk fried chicken ($25). Two pieces of deboned dark meat rested atop a warm Napa cabbage and apple slaw. The chicken was tender and crispy, but I missed the bones – eating fried chicken with a fork and knife just seems wrong. The slaw was also mayo based, so the warmth was disconcerting. I had called ahead to request coffee ice cream for Steve’s birthday (he prefers it to cake). 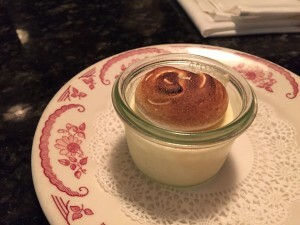 They kindly brought it, as well as a mini frozen lemon soufflé, with a candle in it. The ice cream was excellent – smooth, dark and roasty. I loved the frozen soufflé, as well. It was a perfect balance of sweet and tart and bright lemon flavor. The complimentary rolls were hearty and rustic and served warm. They also offer still or sparkling water, free of charge. The service was excellent. Steel & Rye is a great choice if you are on the south shore. All of the extra nice touches really elevate the restaurant.